The Ozone Layer Flight Suit: The Ozone Layer is a high performance one-piece flight suit designed to shield you from the elements at cloud-base. Freezing high altitude temperatures and speed-bar induced windchill will no longer get you down, and you will cruise toward your cross country goal in comfort and style. 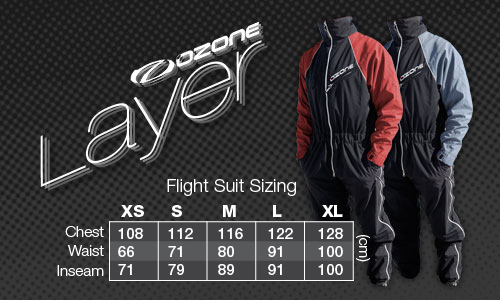 A 3-layer waterproof / windproof shell with mesh liner, full leg and chest zips, zip pockets, and a high collar to keep your neck warm, the Ozone Layer is a high-tech flight suit at a reasonable price for pilots of all abilities. PLEASE NOTE: NOT ALL SIZES AND COLORS MAY BE AVAILABLE. Please Choose Size & Color: X-Small Red Small Red Medium Red X-Small Grey Small Grey Medium Grey Sorry, no more Large or XL sizes~!